Three groups of blueberries Vaccinium ssp. (Ericaceae) are important for commercial cultivation, all needing a very acid soil for cultivation. One or other produces fresh fruit throughout the summer into autumn. The first and now most important is the highbush, developed from Vaccinium corymbosum and Vaccinium australe, two highly variable species, native to eastern North America. Both are deciduous shrubs growing to 12ft high, although the highbush blueberry in cultivation is maintained at about 3-5ft. The second is the rabbiteye blueberry, Vaccinium ashei, with slightly smaller fruits, deciduous and growing wild in southern parts of the US to 30ft. Low bush blueberries, Vaccinium myrtilloides and Vaccinium angustifolium, are also native to the eastern US, growing to 6-18in. tall, with the smallest fruits and spreading by underground shoots. Blueberries were collected from the wild for many years before being cultivated commercially: even today lowbush blueberries are chiefly picked from managed wild populations, accounting for two-thirds of the blueberry land in North America. Lowbush blueberries were the first to be cultivated (or managed) in the 19th century; they are now seldom grown. Rabbiteye blueberries were commonly cultivated in Florida at the end of that century, and there were also some commercial plantations of highbush blueberries in the northern states at about that time; rabbiteye blueberries are much more productive, being both heat and drought-resistant when these conditions prevail. The real stimulus to highbush growing came early in the 20th century when a breeding programme was started by the US Department of Agriculture, under Dr. Frederick Coville. Based on interspecific hybridisation, the first cultivars were introduced in the 1920’s, and a second group was introduced in the 1960’s. These form the basis of the successful industry of today. 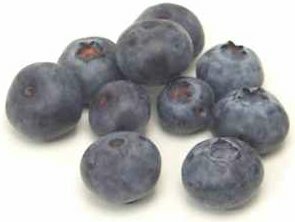 The largest area of cultivation is North America, where highbush blueberries account for more than two-thirds of production. Highbush blueberries have also been grown successfully in Europe, Israel and Japan, and more recently in Australia and New Zealand for marketing out of the northern season. The main breeding programme is being undertaken in North America, to produce cultivars with more resistance to diseases and to winter injury, for mechanical harvesting, and with a longer fruiting season. New cultivars have also been introduced in Germany and in Australia, selected for local conditions. New low-growing, very hardy cultivars (‘half-high’) have been bred in Minnesota, so extending the area of cultivation into regions where they will survive temperatures of -34ºC or lower under snow cover. Recently, tetraploid cultivars of rabbiteye blueberry have been introduced; this species is more tolerant of heat and drought than the other types, and also has a lower chill requirement, so can be grown in the southern states. Most of the fruit goes to the fresh market, but there is also a quantity used for processing. Blueberries produce scented flowers in spring and most cultivars show highly coloured foliage before leaf-fall, an extra advantage in the garden. Highbush blueberries have a minimum cold requirement of 800 hours below 7.2ºC, which limits potential cultivation to climates with cold winters. Rabbiteye blueberries need less than half of this, depending on the cultivar, so can be grown in warmer climates (e.g. Florida). Lowbush blueberries are, in general, the hardiest and rabbiteye the least hardy. In the highbush blueberry, susceptibility to low temperature injury varies with the cultivar and degree of hardening, being most resistant a month after mid-winter (January) and less so towards spring. The more developed the flowers, the more vulnerable they are to frost. Sites for blueberries need good air circulation to allow frosty air to drain away easily, but shelter from strong winds is also required. Good light is essential, as flower buds initiation and wood ripening are better with high light intensity. 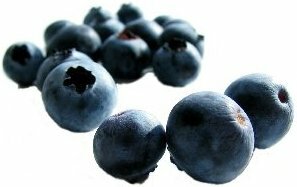 Well aerated, well drained, acid soils, high in organic matter (11.5%) are ideal for blueberries; sandy-loamy soils are used for commercial crops. Optimum soil pH is 4.3-4.8, but 4.0-5.5 is tolerable. Highbush blueberries are self-fertile and a single cultivar will fruit if grown on its own, although growing two cultivars will improve yields. A relatively high fruit set (80%) is needed to give a good commercial crop, so bee colonies are commonly introduced at flowering. Bumble bees are the best pollinators. Lowbush blueberries usually set fewer fruits and introduced bees are essential at flowering. Rabbiteye blueberries are self-fertile and must be interplanted with another cultivar. Bushes of two or three years old are planted (certified ‘disease free’ stock is available in North America). In the UK, three-year-olds are preferred as there may be a high loss among two-year-old plants. Plant after leaf-fall in autumn or early winter to allow them to become established before winter; in very cold climates, early spring planting is more usual. Spacing in gardens for highbush blueberries is 1.5m each way; commercially highbush blueberries are grown 1.2-1.5m apart between the rows. Rabbiteye blueberries are planted at 1.5-1.8m. Lowbush blueberries are grown as groundcover. It is advisable to test the soil pH regularly, as signs of nutrient deficiencies will soon appear on soil that has become too alkaline. Highbush blueberries respond to nitrogen feeding, depending on soil type, but in gardens good results have been obtained by applying a base fertiliser (2:2:1 superphosphate/hoof and horn/sulphate of potash) at 15g/m² in early spring, followed by sulphate of ammonia at 15g/m² a month later. Some commercial growers apply a complete fertiliser, others give sulphate of ammonia or urea: rates of nitrogen recommended are 35-140kg/ha, according to local conditions. Blueberries are surface rooting, so any cultivation must be shallow. Mulching is generally recommended for blueberries in gardens and helps to maintain the high content of organic matter in the soil, as well as conserving soil moisture. Granulated bark or composted softwood sawdust are among the most suitable materials, applied initially as a thick layer (10-15cm) and renewed annually to a depth of 2.5cm. Mulching and clean cultivation, with or without a grass strip between the rows, are common commercial soil-management practices. Highbush blueberries need about 2.5cm of rain per week during the growing season, more when fruits are developing. Both trickle and overhead irrigation are used commercially to make up any shortfall. Lime-free water (rainwater) must be used. Rabbiteye is more tolerant of dry conditions than the highbush. Regular mulching will help to control weed growth in gardens; herbicides are widely used for weed control in the US, although their use is complicated by the need to maintain a high soil content of organic matter. Pruning is light in the first 2-3 years after planting, only removing broken or damaged shoots and also any flower buds that may form. The best fruiting wood is on two-year-old and three-year-old shoots, so pruning is aimed at encouraging a good supply of young shoots. Highbush blueberries are grown as stooled bushes with several shoots arising from soil level and, once annual pruning is started, from the third or fourth year, about one in four of these shoots is cut out completely. New shoots are produced from the basal buds remaining. Lowbush blueberries are not pruned by cutting, but are burnt over at intervals to rejuvenate the plants; this is usually done every two or three years when the soil is flooded or frozen. Rabbiteye blueberries need little pruning to stimulate growth but it is used to keep bushes at a height just below 3m. Fruit on bushes taller than this is difficult to harvest by machine. Late summer pruning to remove shoots above 90cm completely or to 5cm has not reduced subsequent yields. Fruits of highbush blueberry are blue/black, about 2cm in diameter, covered with a white bloom. 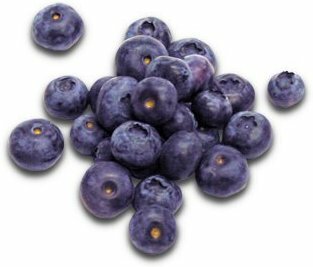 They are not fully ripe until a week after they have turned blue, and therefore need selective harvesting. When picked by hand, fruits are rolled between thumb and forefinger to separate them from the stem. The first-ripened fruits are largest, and the commercial crop from the first two pickings is sent to the fresh market. Over-the-row machines may be used for the subsequent picks, and these fruits are likely to be sent for processing, for which quality is less important; losses of up to 30% fruit are frequent with mechanical harvesting, which is also likely to cause damage to the bushes. In the garden, the problem of birds eating the ripening fruits is considerable and the only satisfactory control is to net the bushes before the fruits start to ripen. Fruits of lowbush blueberries usually go for processing; they are raked off the plants with a handheld tool or by machine. Highbush blueberries are usually increased by softwood cuttings. Lateral shoots 10cm long plus heel are taken from one-year-old shoots are midsummer. All leaves except the top two or three are removed and the cuttings inserted in a firm, sandy mixture, at 20ºC. Cuttings should root in about four weeks. Rabbiteye blueberries are also usually propagated by softwood cuttings but hardwood cuttings are sometimes used. 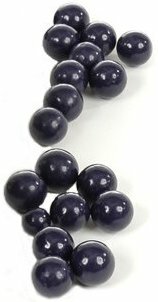 Hardwood cuttings are also used for highbush blueberries; particularly in North America, and it is known that shoots thicker than 5mm root better than thinner shoots. Shoots of 10-15cm long are taken from dormant bushes; they may be taken in early winter and stored in polythene bags at -1ºC to +1ºC for four months to avoid any risk of winter damage in the fields. Tissue culture has also been used for highbush and rabbiteye blueberries, but both types are slow to proliferate and the technique is not economic on a large scale. Lowbush blueberries are usually propagated by rhizome cuttings. In gardens with a spoil pH that is too high for highbush blueberries, plants can be grown in wide-diameter containers of at least 60cm deep or, on a larger scale, in specially made beds lined with heavy grade polythene sheeting. The ideal planting mixture is acidic and sandy with a light organic content; water with rainwater. Plants in these conditions will need fertiliser, in the form of nitrogen, from the start of growth in spring, plus a high potash feed given every ten days from the start of flowering until fruits start to ripen. Other cultural techniques are the same. ‘Bluetta’ is a good cultivar for open garden and container growing. The following cultivars are recommended. Seasons cited are for North America; they will be later in northern Europe. Highbush. Early: ‘Bluetta’, ‘Collins’, ‘Earliblue’, ‘Patriot’, ‘Sharpblue’, (for warmer regions). Early/midseason: ‘North Country’, ‘North Sky’, ‘Northblue’, ‘Northland’ (all very cold-resistant). Midseason: ‘Berkeley’, ‘Bluecrop’, ‘Bluejay’, ‘Blueray’, ‘Herbert’, ‘Ivanhoe’. Late: ‘Coville’, ‘Elliot’, ‘Jersey’. Lowbush: ‘Putte’. Rabbiteye. Early/midseason: ‘Brightwell’, ‘Premier’, ‘Tifblue’, ‘Woodard’. Midseason: ‘Briteblue’, ‘Climax’, ‘Delite’. Other tasty berries you might like to try and cultivate are Bilberries, Blaeberries, Huckleberries, Whinberries and Whortleberries. Since they are of the same genus as Blueberries (Vaccinium) they are also featured on this website, in the section about Cranberries.